I'm the first to admit I usually skip breakfast simply because I wake up so late so I barely have enough time to even sit down for two minutes. However lately I've got into the habit of waking up half an hour earlier so I can actually chill and sit down and have breakfast so I'm not having lunch by 12:30pm. 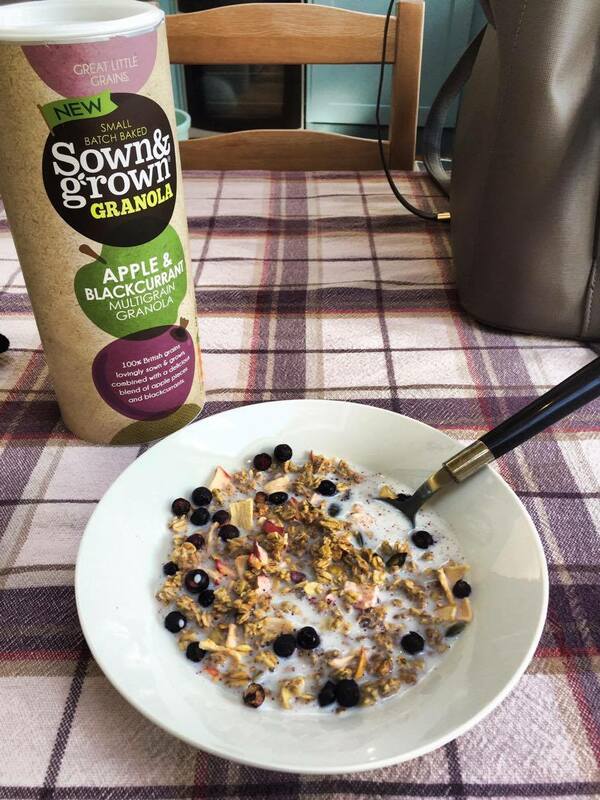 After being introduced to the brand Sown & Grown it has now become a part of my daily morning routine! Nuts & Seeds Granola: A moreish mix of delicately honey coated oat and wheat flakes packed with almonds, brazil nuts, pumpkin seeds and linseeds. Three Grain Granola: A wholesome blend of barley, spelt and oats, finely coated with honey that are small batch baked and then almonds, linseeds and pumpkin seeds are then added. Mixed Berry & Nut Muesli: A rich assortment of Brazil nuts, almonds, hazelnuts, sultanas, blueberries, strawberries and raspberries pieces, blended with British Oats, Wheat, Barley, Spelt and Rye. Four Grain Muesli: A tempting combination of oats, wheat, barley and spelt, gently blended with sunflower and pumpkin seeds. Apple & Raspberry Muesli: An uplifting and nourishing fruit-filled blend of raspberry and apple pieces, sultanas and pumpkin seeds, gently blended with oats, wheat, barley, spelt, and rye. Personally I could eat this at any time of the day, I love having it with vanilla almond milk in the morning and with some natural yoghurt in the afternoon. The cereal is bursting with flavours so I don't feel the need to add anything else to the mix! My personal favourite is the apple & blackberry wholegrain granola, but for the 3 grain (the most nutritious of all) I recommend adding some fruit with it as I like that extra kick. I love that it comes in a cute tube making it easy to store and pour and there's no fussing with the plastic bag inside the cardboard which usually leaves half of my coco pops on the kitchen counter. Sown & Grown is now available across most Sainsbury's stores and are priced at a decent £3.95 per tube which gives you 11 servings. More so, it's a lot healthier and tastier than your regular bowl of Lucky Charms!